Get Cozy at Sweet Home Bingo | Coming Soon! Soon you can cozy onto the reels of Sweet Home Bingo, the newest UK online site coming soon settle onto the scene for 2016! It was only a matter of time before there was a new sweeter than sweet bingo brand in town! Since rumourville is in overdrive, naturally we had our ears to the grapevine to see if we could uncover some more juicy details about the new homely site for you! So far there is no landing page, but if the gossip is true, the exciting new brand will set up home on Cozy Games’ Live Bingo Network. We carried on searching for clues and did catch a glimpse of the Sweet Home Bingo Facebook page. If the cover photo is anything to go by, then you'll be transported to a rolling country side scene, with a ginger-bread style house, white picket fence and scattered game balls. 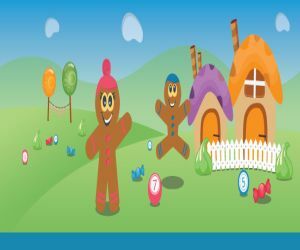 You'll be welcomed to the reels by by some animated ginger bread characters, eagerly waving and jumping to greet you! One thing we can be sure of, is that you'll be greeted by a generous Cozy games welcome package. If it's anything like Big Love Bingo then if you deposit your first £10, you'll be able to collect a loving 500% match bonus, as well as a 350% second deposit Bonus and a 300% third deposit bonus! As you settle into the cozy reels, we're sure you can enjoy all the home comforts as you're spoilt with sugary sweet promotions, bonuses, jackpots and perks! If the site is anything like Big Love Bingo you can expect some sugar-rushing 30 Ball, 75 Ball, 80 Ball and 90 Ball bingo rooms, plus tantalizing slots and adrenaline-racing casino contests! Watch this space for all the latest site details!